I cleaned out and packed up the bottles from the wine cellar I kept at an offsite storage facility and thought a vertical tasting of a Cadence Winery bottling would be a fine reward for all my lifting and hauling. (And lack of breaking.) So here are my thoughts from tasting (and drinking) the 2002, 2003, 2004 from Washington State’s storied Ciel du Cheval Vineyard located in the Red Mountain AVA. Winemaker Ben Smith clearly likes Cabernet Franc, something we have in common. Each wine is a blend of the same four grapes (Cabernet Sauvignon, Cabernet Franc, Merlot, and Petit Verdot) and, though in differing quantities* each vintage, the Cabernet Franc really comes through. I am a fan of this grape because it lends, to put it technically, “unfruity” flavors. Like, for example, green bell pepper. Now you may not like vegetables in your wine, but subtle notes of bell pepper and other green flavors, like herbs, can add wonderful contrast and complexity. It also helps a wine from being too dominated by oak or sweet fruit. 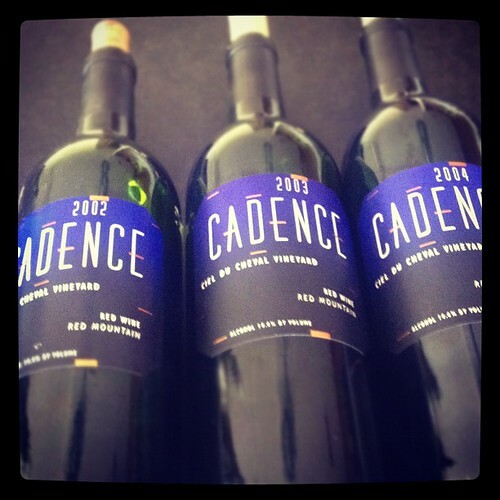 For the musically-inspired Cadence Winery, it seems appropriate to describe Cabernet Franc as bringing harmony. It’s fascinating to note the differences in each wine due largely in part to the vagaries of the weather each year. My favorite was the 2002, and I’m not just saying that because it’s the oldest, though I may have been suffering from a psychosomatic wine geek malaise. It just was at a very nice point in its drinking life, with freshness and fruit along with some of the more savory flavors you get from a wine being a decade old. The influence of oak barrels on the wine was fading, so it was devoid of sweet vanilla flavors that you get with young, oaky reds. The 2003 was the mouth-coater: rich and sappy. Comments from the crack team of wine drinkers I had assembled ranged from earthy to roasty to ashy. (And not in a bad way.) Smelling the 2003 did elicit the wine descriptor of the night: “potting soil.” A little one-dimensional out of the gate, it definitely hit its stride after being open for a while. It was excellent with blue cheese. The 2004 was appreciated for bringing some youthful exuberance to the party, but probably needs to take a nap for a few years. 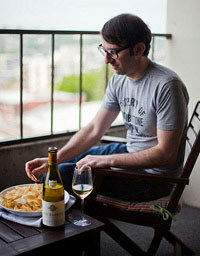 Special thanks to @wawinereport, @BlackPearlSEA, and Peter for the company, the cheese, and thoughts. They are all very knowledgeable about the world of Washington wine. I was just searching google for the best tiime to drink my Cadence 2004 (which I’ve been holding onto since I bottled it several years back), and stumbled upon your review. 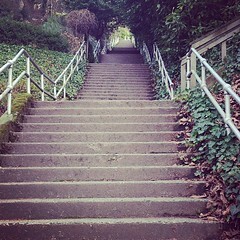 I also wanted to comment on your picture of the stairway to…? It seems all to familiar, and if my memory serves me correctly it’s the daunting stairway leading up to Broadway in Seattle. I had a dear friend that lived off of that trec and I always dreading going to visit her, ugh! Either way, Cheers to your for “no breaks”!!! Thank you for reading and the comment. Luckily I still have a bottle of each vintage, so I’m going to leave them alone for a few years.